If you are entertaining a group of friends with varying food preferences, this recipe works wonders. A tostada is a fried corn tortilla smeared with refried beans. It can be topped with anything from chicken to beef to sautéed mushrooms. Garnish with shredded lettuce, chicken, and mushrooms. Add a drizzle of Mexican crema and crumbled queso fresco, maybe even a bit of salsa verde for heat! 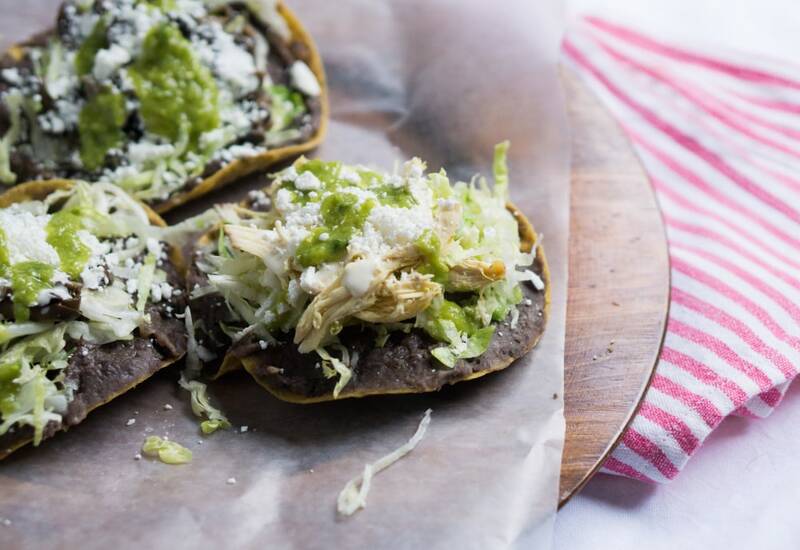 The best part is, everyone can cater their own tostada to their individual taste buds. If you want additional healthy vegetarian options, try avocados or sautéed vegetables. They work great and everyone loves them - vegetarian or not! You can mash black beans or white beans instead of using refried beans. Shredded pork or steak can be used in place of the shredded chicken. Cotija cheese can be used in place of the queso fresco. Sprinkle chopped jalapeño pepper over the tostada for some heat. Per Serving: 485 calories; 25g fat; 43.5g carbohydrates; 23g protein; 65mg cholesterol; 851mg sodium. I love tostadas, they are definitely one of my favorite things eat and they are so easy to make. This is recipe is nice and simple to follow. I would certainly suggest adding Guacamole, that is MUST in my tostadas. there are many steps in this recipe but the outcome is pretty good. i would do without the mushrooms. I made vegan tostadas using roasted red pepper hummus and sautéed zucchini. So good. Grapeseed oil was perfect for frying these up! Great tasting Mexican tostadas! I didn't use the mushrooms though. I also used rotisserie chicken. Definitely one of my favorite quick and easy weeknight meals. Avocados made these vegetarian tostadas taste amazing. Lots of crema, lots of cheese. I tried the tortillas in vegetable oil because that's all I had. Next time I'll have to try frying with grapeseed oil.